You will need 1 x Vacuum Pac machine and 1 x medium Vacuum Pac bag for this recipe. Brew the Elegant Earl Grey tea and the Lively Lime and Orange Fusion tea separately. Strain teas into a bowl and set aside to cool, reserving the tea leaves. Place duck breasts in a high-sided container with 1 teaspoon of Elegant Earl Grey tea leaves. Add the apple juice, eschallots, coriander seeds, bay leaf, and thyme and eschallots. Cover and place in the fridge for 2 hours to marinate. Drain duck breasts from marinade and place in vacuum bag. Add the duck fat and beef jus and season with salt and pepper. Add 100ml of Lively Lime and Orange tea and ½ teaspoon of reserved tea leaves. Seal bag and cook in 48°C water bath for 25 minutes. Combine oil, orange juice and zest in a small bowl. Season with salt and pepper. Arrange lettuce, walnuts, beans, olives and tomatoes on serving plates. 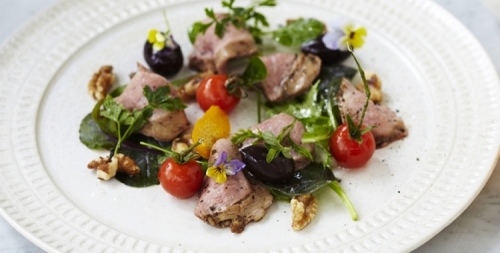 Thinly slice duck and arrange over salad. Drizzle with dressing and serve immediately.